Multiple Teams · Aug 2 2018 Football Season is Starting! All football practices begin on Monday, August 14, 2017. Upperclassmen report at 6:30 am to Cypress Springs, Parent pick up will be at 11:00 am. Please make sure you are on time and ready to go at 6:30 am. Freshmen report at 7:30 am to Cypress Springs, Parent pick up will be at 11:30 am. 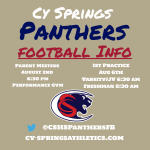 Meet the Panthers will be on Wednesday, August 23 at 7:00 pm in the Cypress Springs Performance Gym. Come meet the Panthers from Cross Country, Volleyball, Football, Band, Cheer, and Panteras. It will be a great night full of Panther Pride! 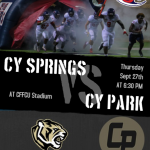 Thursday, October 27, 2016 5:00 PM Cypress Springs High School AWAY 27 Cypress Lakes High School HOME 18 Game Recap The JV Red Team wrapped up a successful 2016 football season with a victory at Cy Lakes! Great Job Panthers!